"The world will never know the true facts of what happened." There are few unsolved mysteries as disturbing as that of the death of President John F. Kennedy in Dallas in 1963. The assassination initially appeared to be the work of a lone gunman named Lee Harvey Oswald, firing from the 6th floor of the Texas School Book Depository—that is, if you were to believe the official story. Occurring in a time before 24-hour news channels and compact video cameras, the murder of a president was recorded on just a few shaky frames of film, and a couple of grainy, but pivotal, photographs that have fueled endless debate over who exactly killed Kennedy. Was there a conspiracy? Was there more than one gunman? This 2-disc documentary is a collection of the 5-part 1998 production, as well as a final section done in 1995, all directed by Nigel Turner. You can tell from the title that the tone here does not accept the lone gunman theory and fictitious 26-volume Warren Commission report, and over the course of more than 300 minutes presents a dizzying and convincing sea of modern-day interviews (to 1998) with witnesses and researchers, combined with archive footage that is compelling and frightening. Narrated by stern Brit Hilary Minster, the series moves along briskly with no reenactments, instead relying simply on narration and interviews to relay the details. As a refresher, this is where we are re-introduced to the chain of events, from the assassination, to Parkland Hospital, to the murder of police officer Tippet, to Oswald's arrest and subsequent murder by Jack Ruby. Key interviews here feature former Texas Governor John Connelly (who was also shot during the assassination) and Parkland doctors McClelland and Peters, who worked on Kennedy that day. Researcher Robert Groden, who was one of the first to re-analyze the infamous Zapruder film in the mid-1970s, introduces the idea that Kennedy was killed by a shot from the front, not the back. It is here that the real conspiracy angle kicks in, highlighted by focusing on the grassy knoll, where many witnesses claim the fatal shot came from. Mary Mormon's legendary "Badge Man" photo, which purports to show a man firing from behind a stockade fence, is discussed at great length. One of the eeriest moments comes when Gordon Arnold, a man who claimed to have been behind the fence at the time, is shown the enhanced photo which depicts him only a few feet away from "Badge Man", and Arnold's response is a mixture of fear and emotion as he realizes he may have been only three feet away from the real assassin. The woman known as "Babushka Lady" is also interviewed, and she also believes the grassy knoll is where another gunman fired. The segment also connects the Corsican mob, and identifies three hitmen believed to have been involved. Was there a cover up? I think so. 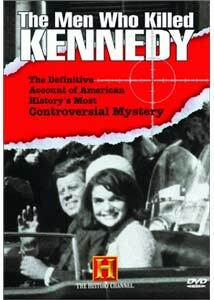 Here we learn of conflicting testimony from witnesses that was conveniently omitted from the Warren Report so as to support the lone gunman theory, and questions about possible holes in Kennedy's security detail are explored. The autopsy of the president is another area that seems rife with suspicious actions, including why two Naval pathologists with no experience in forensic pathology were used on what has been called "the autopsy of the century." Where is Kennedy's brain? Well, it's "missing" in case you were wondering. The highlight is a prison interview with Charles Harrelson (father of actor Woody), who, in 1988, was serving a sentence for the murder of a federal judge. For years, Charles Harrelson was suspected to have been one of the mysterious "3 tramps" found in a boxcar in the railroad yard behind the grassy knoll. Lee Harvey Oswald claimed he was a "patsy" in the assassination, and this segment pays close attention to the alleged assassin. His Russian connections are investigated, and questions are raised whether he killed police officer Tippet. The real weirdness here involves allegations of a corpse head switch, which came to light after an exhumation of Oswald's body in 1981 revealed apparent tampering to his coffin. Jim Garrison, who was portrayed by Kevin Costner in Oliver Stone's JFK, offers his spin on Oswald, and continues to point toward conspiracy. Oswald's arrest at the Texas Theater is discussed by the officers involved, and the first mention of the possibly faked "backyard photo" is analyzed. Parkland doctor Peters, who had also worked on Kennedy, gives his recollections of attempting to resuscitate Oswald after he was shot by Jack Ruby. To further creep you out, the military-industrial complex is painted as the driving force in wanting Kennedy gone. This section is a follow-up of sorts, and was put together in 1995. Highlights are interviews with Oswald's widow Marina, and a computer analysis of photos that hint that an assassin may have been firing from inside a storm sewer. A former Army colonel, trained in assassinations, provides the spookiest moments as he recalls being asked to kill a Naval officer who was involved with analyzing autopsy footage. His tale is downright chilling. The Men Who Killed Kennedy is must-see for those who question the facts surrounding the murder of John F. Kennedy, and this 2-disc set will be an indespensible addition to the other important critical evaluations of that day. Image Transfer Review: The 1.33:1 full-frame transfer for parts one through five shows its age (1988), with many of the interview segments looking slightly pale and faded, as well as a fair amount of specks. Obviously the archive footage used is generally poor, but that is not a fault of the filmmakers. Part six, assembled in 1995, sports brighter colors and fewer blemishes. Audio Transfer Review: A&E has released The Men Who Killed Kennedy in its original 2.0 stereo mix. Narration and interview segments are clear and understandable, with a minimum of flash; this is a straight forward documentary, and it is presented as such. Extras Review: The only supplement is on disc 1, and it features a timeline that highlights key moments between 1917 and 1964, pertaining to the assassination. In addition, each episode is divided into 6 chapters. Every conspiracy buff should have a copy of Oliver Stone's JFK, High Treason by Harrison Edward Livingstone and Robert Groden and now, this excellent 2-disc eye-opener. The Men Who Killed Kennedy is a disturbing look back at one of the greatest cover-ups of all time; it is well-researched, very detailed and something that everyone should see.